Cameron Bricker stands in front of the Camp Fire totem poles he carved this summer with poles provided by SCE. Cameron Bricker, right, and Larry Pool, his Camp Fire totem pole adviser, pick up one of the two totem poles they carved this summer. SCE delivers logs to Camp Fire in Long Beach for a totem pole project. Before Cameron Bricker could begin carving he had to remove the outer bark from the incense cedar logs, which SCE donated. Cameron Bricker, left, is handed a chisel and hammer by his Camp Fire totem pole adviser Larry Pool. Cameron Bricker used a chisel and a hammer to add the final details to this totem pole symbol. Southern California Edison donated four logs from its Shaver Lake forest in the Sierra to help with the Camp Fire project. 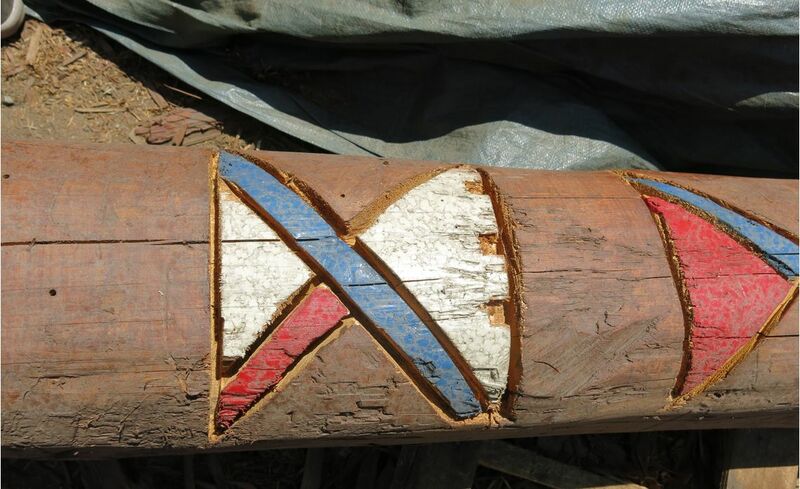 Cameron Bricker knew he had a big project on his hands this summer when he took on the task of carving two new totem poles for the Camp Fire facility in Long Beach to replace the two existing poles erected 15 years ago. 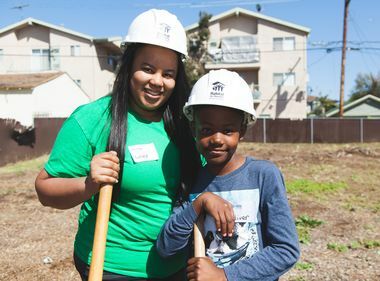 Similar to the Boy Scouts, Camp Fire is a 94-year-old Long Beach nonprofit that teaches youth development and leadership. For Bricker, 17, completion of the totem poles would be the culmination of his years in Camp Fire, which he joined when he was in first grade. It would also earn him Camp Fire’s most prestigious Wohelo Award, which is equivalent to an Eagle Scout. Bricker started designing his plan for the project, including selecting the Camp Fire symbols he would carve. Cameron Bricker carved this Camp Fire totem pole symbol into an incense cedar log with a chain saw, then painted it using enamel paint. His plan was ready in May, but he was still missing the most important thing — the wood logs to carve. That was when Shirlee Jackert, Camp Fire Long Beach’s executive director, thought of Matthew Garcia, a Camp Fire board member and a senior manager at Southern California Edison. 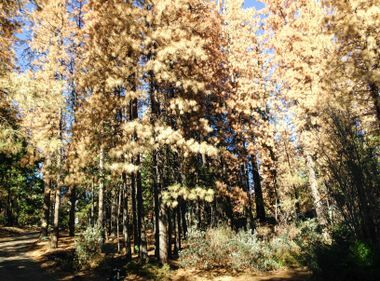 What Jackert didn’t know was that SCE has a 20,000-acre forest at Shaver Lake in the Sierra east of Fresno where SCE crews routinely fell trees. 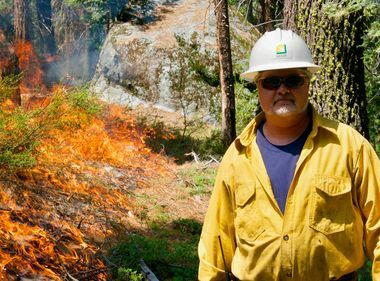 Garcia called SCE’s Shaver Lake forestry staff, which immediately agreed to help. Stewart selected four incense cedar trees — he included two spares, “just in case” — and cut them down to 10 feet. They were shipped via an SCE materials transport truck that brings equipment and supplies to SCE’s nearby Big Creek hydroelectric facility every week. Soon, Bricker had his logs and prepared for his biggest challenge — carving them with a chain saw. Bricker was lucky to have Larry Pool as an adviser. Pool is a retiree who volunteers at Camp Fire and helped with the last totem pole project 15 years ago. “I showed him how to use the chain saw (for carving) and then follow up with a wood chisel,” Pool said. Bricker and his Camp Fire helpers stenciled the designs on the logs. He carved the preselected symbols with the chain saw, working his way from the simple designs that had straight lines to the harder curved ones. They hand chiseled the last details into the symbols before painting them. The work was done over three weeks and the poles were unveiled in a ceremony in mid-August. Besides earning the Wohelo Award, Bricker said the project allows him to leave a legacy to Camp Fire, which has been such a big part of his life. Jackert, the executive director, said SCE’s willingness to donate the poles was key to the project’s success. “It shows how committed Edison is to the community,” she said.